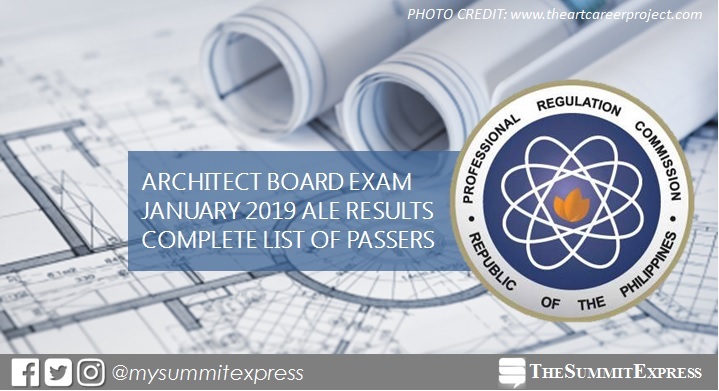 MANILA, Philippines – The January 2019 Architect board exam or Architect Licensure Examination (ALE) official results to include the full list of passers, top 10 (topnocthers), top performing schools and performance of schools are released online on Wednesday, January 30 or in three (3) working days after the exam. As announced, 1,120 out of 1,990 passed the exams. The Professional Regulation Commission (PRC) and the Board of Architecture (BoA) conducted the licensure exam in Manila, Baguio, Cebu, Davao, Legaspi and Zamboanga on January 25 (Friday) and 27 (Sunday). The Board of Architecture who gave the licensure exam is headed by its Chairman, Arch. Robert S. Sac and board member, Arch. Robert M. Mirafuente. From February 14 to February 20, 2019, registration for the issuance of Professional Identification Card (ID) and Certificate of Registration will be done on-line. Please go to online.prc.gov.ph/ and follow instructions for initial registration. In few days after the release of results, the Verification of Rating (VoR) page of PRC for January 2019 ALE will be available online. Enter the required information - exam name, exam date, application number, name and birthdate to verify identity. The two-day exam covered the following subjects: history and theory of architecture, principle of planning and architecture practice, utilities systems, structural conceptualization, building materials and construction (Day 1) and architectural design and site planning (Day 2). According to PRC Resolution No. 1127, which deals with the 'Schedule of Licensure Examinations for Year 2019', the target release date of Architect board exam result is on Wednesday, January 30, or in three (3) working days after the tests. However, results are possible to be released ahead of the target or on later date, without prior notice. In the same period last year, results were released online after four (4) working days. A total of 1,126 out of 1,955 passed the Architect board exam. In the January 2017 exams, results were out in five (5) working days. PRC named 919 out of 1,595 who have passed the exams. In the January 2016 exams, results were also announced in 5 working days. A total of 866 out of 1,556 passed the tests. The Summit Express will update this page immediately once the results are officially released online. Monitor announcement of results here or visit the official website of PRC (prc.gov.ph) for more information.